Sold Out Sales & Marketing’s ‘Jurassic World has to settle for No2 on it’s debut, as Activision Blizzard’s ‘Crash Bandicoot N.Sane Trilogy’ holds off competition to retain the No1 spot in the Top 40 All Formats Chart. Ubisoft still have 2 titles in the top 10, with ‘The Crew 2’ dropping one place to No3 and ‘Far Cry 5’ jumping 2 places to No8. ‘Star Wars Battlefront II’ also stays in the top 10 due to a continued retailer promotion as it drops down to No9. The second new release in the top 40 goes to THQ Nordic’s ‘Red Faction: Guerrilla Remastered’ debuting in at No20. When does the German chart update? Good hold for Tennis Aces. I guess the World Cup and Wimbledon are paying dividends to their respective game analogues. Nobody cares about Crash. Hehe. Crash still holding strong digital also on the Xbox UK store. 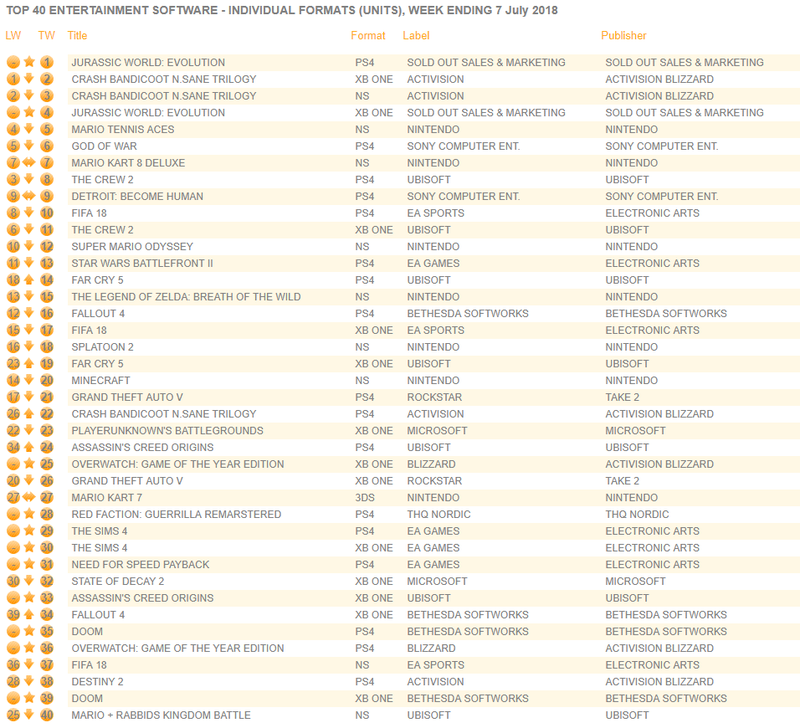 Sea of Thieves out of top 40, SoD might be out too in a week or two. Must have bombed for real....damn, what a bummer. Maybe the free weekend will have some impact on the next week. Really think they screwed themselves with their release date. Bad timing because the game is aces. Bandicoot probably not dropping from charts until the next game releases next year. Splatoon 2 being 1 position behind FIFA 18 X1 on a totally random week is a real achievement I think. Also nice hold for Tennis Aces, here in Italy Nintendo is marketing it like one of their top tier IPs, there's at least one Nadal commercial for it in the break of every World Cup match (and those are aired FTA, so a lot of exposure). I wonder if they are doing the same in other places. (5) (6) GOD OF WAR PS4 SONY COMPUTER ENT. SONY COMPUTER ENT. (9) (9) DETROIT: BECOME HUMAN PS4 SONY COMPUTER ENT. SONY COMPUTER ENT. GAME has been bundling it. King of platformers at the top where it belongs. GTS is gone, again. Strong physical sales from Xbox One, in my opinion in UK. Should be a good chunk above the Switch version with digital. Amazing performance by GOW and Detroit in germany as well. So glad for SSM and QD. Nintendo and Sony doing great in Germany. I really need UK revenue charts. I think the date was okay...but the marketing behind it was non-existent. Should have tried to sell it as a Marrio Kart for PS/XB players. I just hope its successful enough for another attempt. 6 7 GOD OF WAR PS4 SONY COMPUTER ENT. SONY COMPUTER ENT. 8 10 DETROIT: BECOME HUMAN PS4 SONY COMPUTER ENT. SONY COMPUTER ENT. Good to see some linear, structured games taking the top of the charts. I love open world games, but the fatigue is real. Aces doing well in Germany and Spain. People said its getting a lot of advertising so that's a thing. And digital sales for switch version isn't even included in this, which makes it even more impressive. If steamspy is to be believed Crash has crossed 100k on PC. Neat. Crash Bandicoot returns. Again. Part 2. Hooray. So happy about Crash's ongoing success. I hope there will be a new one. God of War the money printer. The moment DLC hits, it’s going to be back on the top. This is probably Sony’s most successful game since the PS2 era. I doubt that they'll release a DLC for GoW, it doen't need one. There probably won't be any DLC for God of War. Imagine it had released as PS Plus title or at least at a lower price point a la rocket league. But you are right marketing is what probably was the main issue here. It better be near finished. HD Remake with Online multiplayer and rocket league esque monetization and mods....watch the cash pile up. GoW is in its fourth month, Sony should give us another sales update. I know it's pretty much just a port, but I wish Tropical Freeze stayed towards the top of the UK charts for a little bit longer. I just wonder how it will happen. If I remember right CTR had more Sony involvement than original Crash trilogy so I wonder if remake would be exclusive or multiplatform. Well, user accounts are around 4.8m. Octopath should be first next week, hope we can figure out numbers somehow. Can't imagine how much GOW one year sales will be like... it's freaking insane! And so happy for Detriot, this game is a masterpiece.